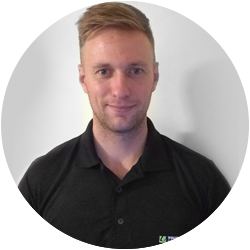 YOUR Personal Training are delighted to announce the success of our new Personal Trainer Matt Roberts. After only 3 weeks in his new role at Skyliner Sports Centre, Bury St Edmunds, he has met his monthly target with a minimum of 11 personal training sessions. What are the top 3 benefits of working with YOUR Personal Training? How many Personal training clients do you have? Have you reached your goal for your PT business? I have 6 gym based clients, I will be delivery a minimum of 11 sessions, in my fourth week. I have met my initial monthly target, but I am yet to hit my goal. How has YOUR Personal Training provided business mentoring to help you in growing your personal training business? I have had daily and weekly interactions, with my regional manager. All of the calls and conversations have been valuable, providing me with detailed information and support. What has been the best aspect of training and development support you have received from YOUR Personal Training? The best aspect of training, is being in a relaxed working environment, whilst doing something you enjoy, with people with similar interests. The best aspect of the Developmental support is receiving the detailed advice support from YOUR PT. Mentors. They have a great deal of experience, which they readily share to help to. kick start your business.